Beautiful Luxury Log Home Rental. Call Us First!!! Top Shelf 3 BR 2 1/2 BA Cypress Log Home. This property is right on the lakefront, with a spectacular panoramic view of 23-mile-long Lake Leelanau. The house is approximately 50 feet from the water's edge, with clean shallow swimming and a mostly sand bottom. Home has a fully furnished kitchen with microwave, dishwasher, stove, and refrigerator. Wheelchair ramps available, lower bed and bath are handicap accessible. Dining area and living area with fireplace, internet TV, and BlueRay player, vaulted ceilings. There is a laundry room and spacious wrap-around deck overlooking the lake. Lawn goes right to the waters edge. This luxury log home is available for year-round rental. Enjoy summer water sports, MasterCraft Ski-boat, Pontoon boat are available for rent on site. Paved walking/biking trail just 1 mile away. Note: For more than 12 occupants, additional charges may apply. Main Level: one bedroom with one King. One set of bed sheets, per each bed, is included for each rental period. Comforters, blankets, pillows and bath size towels are also provided. Activities: Enjoy summer water sports, Pontoon boat are available for rent on site. Paved walking/biking trail just 1 mile away. 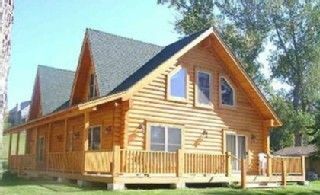 Area: Log home is approximately 8 miles from Traverse City. Also approximately 25 miles from down hill ski resorts, and there is a bike / roller-blade trail, just 1 mile down the road. This business, 'Margies Resort', has been our family owned business since 1941. The Log House was built in 2002. One of the premier locations on Lake Leelanau. Close to Traverse City, about a 15 minute drive. Beautiful sunsets, and very few bugs. Driveway and large field for cars and boats/trailers. Big custom table, seats 8 people. We loved our log house on the lake. The house was well equipped, comfortable beds and beautiful sunsets over the lake. Because of the time of year we stayed, everything was very quiet, which we loved. A few hours out on the pontoon boat offered the opportunity to see the other houses on the lake. If we venture to Lake Leelanau again, we would definitely consider rending Margie's Resort again. Place looked perfect, but there were issues with some of the advertised amenities. Coffee pot needed to be de-scaled, fireplace was not functional, and the gas grill did not work. The owner did offer the borrowing of the neighbor’s grill. We would have preferred to keep the windows open but owner controlled thermostat remotely- this was just kind of awkward. We felt like power was being wasted. Would rather have had use of fireplace when wanting to remove the chill. Beautiful location, great accommodations and helpful owners. We had a great trip!! Loved having you up. You guys were great, hope to see you again. Accommodations were fabulous.........our family had a perfect Christmas at Margie's Resort!! Weather left a little bit to be desired but we put on the fireplace, made hot cocoa & put on a good movie & enjoyed family time. Very close to Traverse City & enjoyed downtown fun. Can't wait to go back!! Look forward to having you up again. We are in the heart of Leelanau County. You can go North and/or West for a quaint village atmosphere, or South and/or East for Shopping and more urban activities. $1600- 4000 + /Week Cleaning Fee $50 for less than one week. A 6% Tax is added to every reservation. $1000.00 Deposit is non-refundable if canceled within 90 days of reservation. Balance DUE two weeks prior to check in. We accept Personal Checks, Cashiers Check or Money Order All Weeks are Saturday PM (check-in 3PM) to Saturday AM (check-out 11AM). Reservations are confirmed via US mail.